"I'm a poet. I get away with this sort of shizzle. It's called being creative, DUH." Excellent literary celeb spot today. 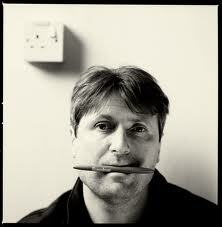 We have been in OUR NATION'S CAPITAL this weekend (say it loudly, in an American accent, just for the craic) and Bedders spotted Simon Armitage at Kings Cross. Honestly, I should contact Heat magazine. Little silver earring (his father thought it bloody queer). Haircut like a sailor. He got beaten up for it 30 years ago, but I note he's still sporting it. I was, like, SO cool. I didn't say 'Hello, Simon.' Or 'I thought The Universal Home Doctor was pretty wicked.' Oh no. I just stared at him and his wife and his daughter. And tracked his movements like a hawk from under the arrivals board to WH Smith. Years ago, I used to have another blog, now mercifully hidden away from public view. It was rather Smiths-quote laden and self-consciously introspective (pah, whaddya mean, what's changed?!). However, I was reminded of this which I wrote on aforementioned embarassing blog. "I'm reading Gig by Simon Armitage - so far, it's proving a satisfying and muchly entertaining read, especially given that it's a) a chunky hardback and b) was bought with a Waterstone's voucher from Christmas I'd completely forgotten about. Kerching. Last night I read the chapter 'On the Road 4', at the beginning of which he recalls an eccentric Science teacher who encouraged his students to complete "little missions" and the lesson in which he and another boy were sent outside to measure the size of the human voice. He describes the system on which they settled - Armitage's partner advancing further and further across the yard and further, shouting and shouting, while Armitage remained still, preparing to drop his arm when he could no longer hear the boy's voice. Then they'd pace out the different between them, and that, approximately, would be the size of the human voice. A pleasing logic, no? The he dropped the clanger, if such a phrase may be used. Thirty years later Armitage was told, presumably via some Yorkshire-based friend or relative in the domestic channels through which these sorts of discoveries are usually made, that the boy, whose name and features he admits he can't even remember, had "shot himself through the roof of his mouth somewhere on the far side of the world." And he felt inspired to write a poem which muses on the idea that no sound dies completely - somewhere in the cosmos every sound, every individual utterance ever made, is still resonating somewhere."